WASHINGTON–(ENEWSPF)–Sept. 11, 2017 — The Total Army, which includes active duty, Reserve, and Army National Guard personnel, remains involved in or prepared to support state, territory and other federal agencies as part of Hurricane Irma relief operations, Army spokesman Col. Patrick Seiber said yesterday. “Governors are best postured to determine the needs of their residents and establish response priorities,” he said. The state governors are using Army National Guardsmen to help meet those needs. 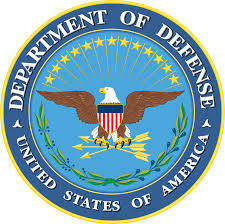 “The Army has pre-positioned or is in the process of positioning equipment and personnel in the affected areas to ensure adequate resources are readily available if needed,” Sieber added. 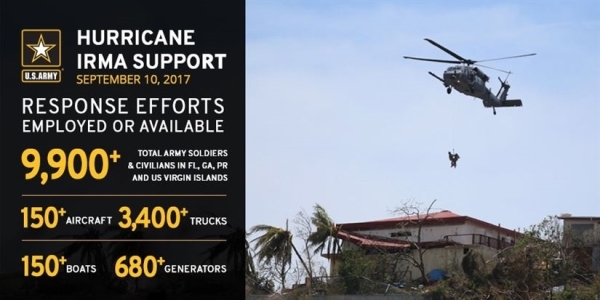 The Army response for Hurricane Irma involves more than 9,900 soldiers and U.S. Army Corps of Engineers civilians in the U.S. Virgin Islands, Puerto Rico and the U.S. The Army has six aircraft, about 500 trucks and more than 80 generators committed to relief efforts with more than 150 aircraft, almost 600 generators, 150 boats and nearly 3,000 trucks on standby to support response efforts if called upon. Army National Guardsmen from Florida, South Carolina, Puerto Rico and the Virgin Islands are on State Active Duty status and are either responding or prepared to respond to each governor’s priorities. Additionally, Army National Guard units in Alabama, Florida, Georgia and the Carolinas are conducting routine inactive-duty training that they will utilize to prepare for a Hurricane Irma response if required. The Army Corps of Engineers is already working in the Virgin Islands and Puerto Rico to assist with power restoration efforts and have teams on standby to assist in Florida if needed. The Corps is also monitoring conditions at the Herbert Hoover Dike around the waters of Lake Okeechobee, Florida, and will continue to provide expert status updates. 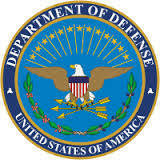 The Army also has active-duty officers assigned with Federal Emergency Management Agency Regions II, IV, and V Headquarters to provide expert military advice on storm response efforts.